3 bedroom apartment furnished in a contemporary but cosy style, in a traditionally built chalet, with spectacular views of the snow covered mountains in winter and grassy meadows in summer. 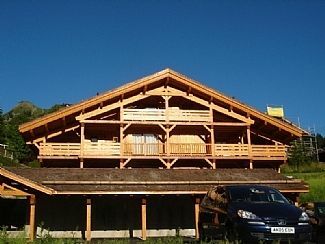 Ideal in the winter, the apartment is situated in the Le Chinaillon/ Le Grand Bornand ski resort (1300m). Situated in the Les Outalays area of Chinaillon, the ski slopes are 50 metres away (Serpentine piste). The ski lifts ,ski school and ski hire are in walking/skiing distance. Skiing couldn't be better for all the family from beginner to advanced. Ideal in summer too, as a base for a host of outdoor pursuits, such as walking, climbing, paragliding, cycling, horse riding, golf, swimming, mountain biking etc. The apartment is very easy to reach, being only an hour from Geneva and 40 minutes from Annecy. The village of Le Chinailllon is a traditional alpine village, picturesque and unspoilt, where the welcome is warm and friendly. The village has a host of shops and restaurants plus a delicious bakery for those early morning croissants. Modern bathroom with bath / shower. Separate WC. Open plan 'wood beamed' living space with L shaped wall to wall sofa for maximum comfort. Contains a TV with DVD and a CD player. Modern kitchen with open plan dinning area, that seats 6. The kitchen is fitted with cooker, hob, fridge/freezer and dishwasher. The apartment is 50m from the ski slopes of Le Chinaillon and walking distance to the ski lifts, ski school and ski hire. The ski school has a great reputation with plenty of English speaking instructors. Le Chinaillon offers 90km of pistes with varying degrees of difficulty and is a good all round family ski resort. A further 130km of skiing is available from La Clusaz, only 15 minutes drive away. Both these ski areas are included in your ski pass. There are also bus transfers between Chinnaillon, Le Grand Bornand and La Clusaz which are covered by your ski pass. The Golf le Rocher Blanc Club open May - October is situated 5km outside Le Grand Bornand. Notes on accommodation: The apartment is situated on the first floor and is accessed up 2 flights of stairs. There is no lift. Bedroom 3 is in the mezzanine and accessed up a ladder. It is not suitable for children under 4. Outside: The apartment has a large sun trap balcony with panoramic views furnished with out door furniture. Cleaning / Towels / Linen / Maid service: Towels and linen are included and changed at the end of each let. The property is cleaned at the end of each let. We have a great stay at half term - brilliant weather and great snow. The location of the Appartment is fabulous - we skied to the door and out (although had to be fairly adept at navigating the bank!). We were able to ski to a lift and were well position for the night skiing on Tuesday and Thursday evenings. Only a short walk to a hotel for a drink / meal. Fab shops down the valley at Le Grand-Bornand. très bonne localisation de l'appart avec accès direct aux pistes. De bons espaces intérieurs, appart très fonctionnel et bien équipé. Merci à Sophie, nous gardons l'adresse précieusement. La propriété et l'appartement sont très propres. il est lumineux et la vue très jolie. l'accès au piste est très pratique. il est un peu éloigné du village ce qui n'est pas dérangeant en temps normal mais nous avons eu tellement de neige que les routes étaient bloquées par les voitures. Nous avons passé un agréable séjour au Chinaillon. Le logement se trouve bien au Chinaillon juste au dessus du télésiège des Outalays et non au Grand Bornand comme localisé sur la carte... L’appartement est tout neuf et relativement bien équipé . La chambre dans la mezzanine est accessible par une échelle assez raide . Il dispose également d’une grande terrasse très agréable et bien exposée. Appréciable aussi la mise à disposition des draps et serviettes de bain. Seul bémol la réception TNT de la TV qui est défaillante . Nous n’avons trouvé que peu de chaînes disponibles et en plus nous n’avions que le son. Il me semblerait aussi important que l’appartement dispose d’un accès wifi. Merci à Tom & Sophie Bingham . Geneva airport is the nearest airport and is under an hour away. Calais is the nearest port and is 532 miles away. 10 minutes from Le Grand Bornand. 15 minutes from La Clusaz. 40 minutes from Annecy. 55 minutes from Geneva. 1 hour 15 minutes from Mont Blanche. Booking Notes: Booking is direct with Owner. A £200 deposit is required and the balance is payable 6 weeks in advance. When paying the balance, an additional £200 security deposit is required to cover any significant breakages etc. This will be refunded or part thereof within 2 weeks from the end of your stay. Changeover Day: Changeover day is Saturday. Arrival not before 2.30pm. Departure no later than 10.30am. Notes on prices: Prices are for the property per week in UK pounds. 10% discount for two week lets.